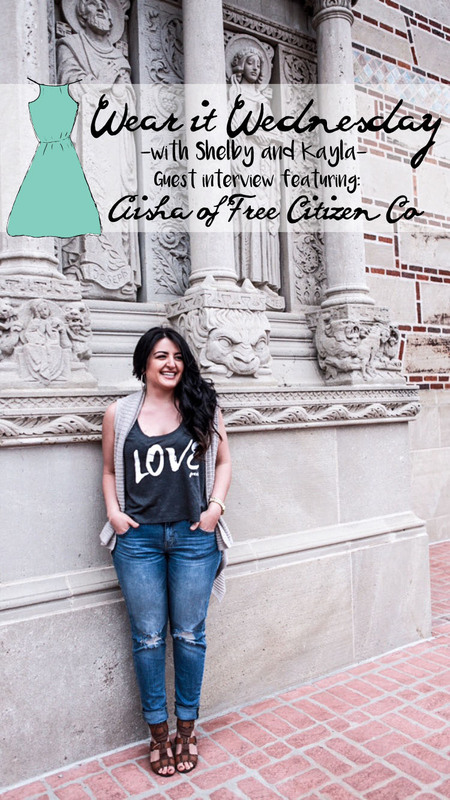 Fashionistas & readers, today we have Aisha of Free Citizen Co, on Wear it Wednesday! 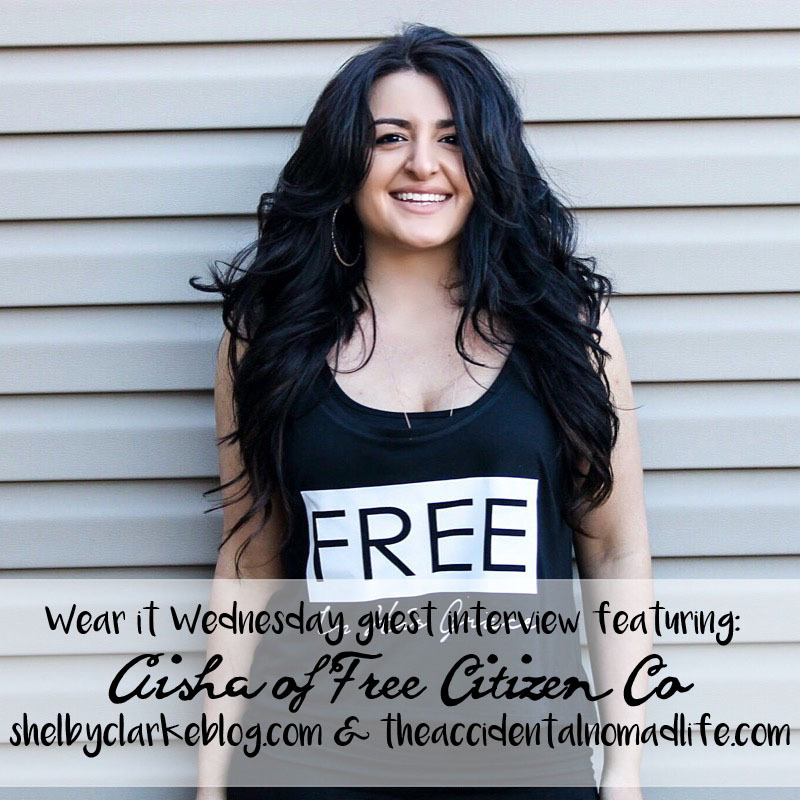 If you don't know Aisha she is a blogger and fashionista that I (Shelby) have followed for a few years now. I love her casual sense of style and love of God shown through her designs! Enjoy getting to know her! Well, I will start with my name ☺ My name is Aisha and I am currently residing in Minneapolis, MN! I work for a major retailer by day as a merchandise planner and am a blogger/ run a non profit ministry by night! I love the outdoors, I love style, I love the gospel. I love living life in Christ and fulfilling the purpose he has for me. What is your current favorite trend? I love waterfall coats and the sleevless turtlenecks- such great style pieces! What do you think about the 2016 Pantone Colors of the year? I love the pinks and dark purples/burgundy. I love the mix of cool and warmth through the rose quartz and serenity but I do not wear a lot of the colors myself! I would say I like to stay simple and classic. A lot of neutrals with a pop of color and I am one to wear simple pieces but accessorize with a great pair of shoes or nice jewelry. Oh! And I love accessorizing with a great jacket. Aisha, do you have any fashion rules when putting an outfit together? What is your next fashion must have? Right now I am looking at nice spring coats as I get ready for my trip to seattle. I am also looking for good summer shoes. I typically go for wedges but this year I want to do more flats and cute tennies. What is your favorite fashion magazine or where do you go for fashion inspiration? I honestly do not look at a lot of fashion magazines! I use Instagram and pinterest a lot for my fashion inspo. I also like to look at celebs with similar body types to see what they are wearing and what kind of silhouettes she is going after. What are your top 3 brands and why? Gosh, that is hard! I am not picky on brands.. but I can name some stores! I love Nordstrom (and the rack) and I enjoy the ecommerce misguided because they have a lot of styles I would wear. I also LOVE Zara!! What takes up the most space in your closet? What is your one staple clothing item? Tank and Tees. I love how easy it is to make a basic tee look like it is the it item. Tell us more about Free Citizen & why you created it. Where does your inspiration for Free Citizen come from? Jesus. 100%. I do not look at other people’s profiles or fashion tees to get ideas. I pray about it and let God lead my mind to what HE wants people to be encouraged by. What lead you to a life in the field of fashion? I have always had a passion for it. I think that the more people told me it was a hard business to be in, the more I wanted to show people I can do it. I never knew how it would come to fruition but am amazed at how God made my dream come to life. How has fashion impacted your life for the better? I cannot tell you how much of a blessing it is to encourage people through clothing. It’s is an amazing feeling to spread the good news through my love of style. It is the best. Through my website and all social media! Instagram and pinterest. I love see people’s lives through photos and color. We hoped you loved getting to know Aisha a little bit more! 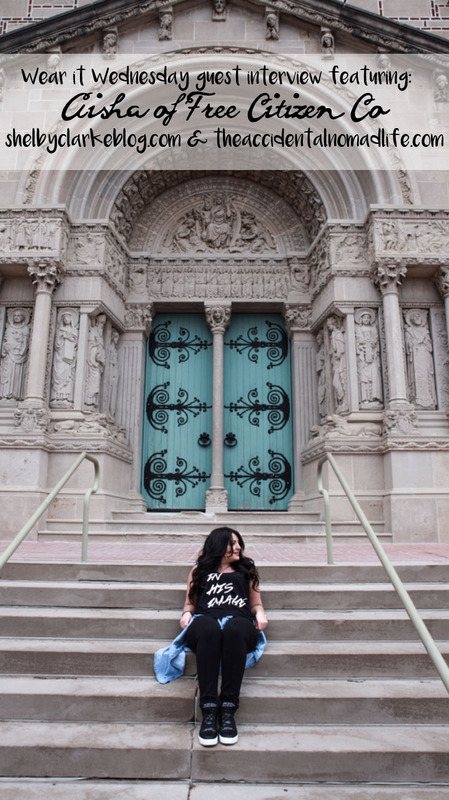 Be sure to follow her and shop her designs which benefit local ministry in Minneapolis, MN! I had a hard time not commenting on her responses, I guess I could do that here...a resounding AMEN! and I totally agree! If you have a fashion blog or would like to contribute to the Wear It Wednesday Interview Series, drop us an email @ wearitwednesday(at)gmail.com!